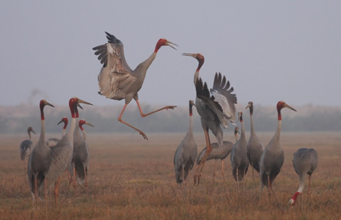 Conservation at two sites important for the Sarus Crane. The wetlands of the Mekong River basin are important for biodiversity and for the livelihoods of millions of Mekong inhabitants. The wetland sites for this project provide habitats for the largest flock of Sarus cranes (a declining and vulnerable species) in the Mekong Delta and support the Lepironia articulata (Cyperaceae) plant community, which now only occurs extensively at Phu My. Despite their importance for biodiversity and for the livelihoods of millions of people, large areas of wetlands in the lower Mekong River basin have been lost and remaining wetlands are subject to unsustainable uses and mismanagement. This project will improve the protection of two important wetlands in the lower Mekong basin by engaging local communities in wetland management through mechanisms that help improve local livelihoods and incentive conservation of the natural ecosystem. Strengthen ability of Phu My and Anlung Pring villagers to produce high quality handicrafts that are sold to premium markets. Assist others to use the Phu My model to conserve wetlands and waterbirds in other regions of Vietnam and in Cambodia. International Crane Foundation, with in-country project coordinator Dr.Tran Triet. The wetlands of the Mekong River basin are important for biodiversity and for the livelihoods of millions of Mekong inhabitants. Large areas of wetlands in the lower Mekong River basin, however, have been lost and many of the remaining wetlands are subject to unsustainable uses and mismanagement. This project will improve the protection of two important wetlands in the lower Mekong basin by engaging local communities in wetland management through mechanisms that help improve local livelihoods and incentive conservation of the natural ecosystem. These wetland sites are in rural areas where local communities depend directly upon the natural resources they can harvest from wetlands. These sites are important for biodiversity conservation as (i) Phu My and Anlung Pring together provide habitats for the largest flock of Sarus Cranes in the Mekong Delta; and (2) they support the Lepironia articulata (Cyperaceae) plant community, which now only occurs extensively at Phu My. Sarus Crane, Antigone Antigone, is designated as Vulnerable with a decreasing population by the IUCN Red List. In Southeast Asia, the International Crane Foundation (ICF) works to save the Sarus Crane; vulnerable to loss of wetlands due to agricultural development, reduced water flows, egg removal, and power line collisions. The world’s tallest flying bird, the Sarus Crane spends the dry season (December through June) on a complex of wetlands within the floodplain of the Mekong River along the border of Cambodia and Vietnam. In healthy floodplain wetlands, the spike rush Eleocharis dulcis produces nutrient-rich, bean-sized tubers that are the primary food of the cranes. Unfortunately, the majority of the wetlands on the Mekong Delta have been destroyed by urban development, rice farming and shrimp ponds. However, along the border between the nations, complicated political tensions have somewhat reduced development pressures. For more than 20 years, ICF has been deeply involved in wetland conservation in this region, through the establishment and management of Tram Chim National Park, the largest wetland conservation area in the Mekong Delta, and by building the capacity of wetland managers through a training program shared among 18 universities in Southeast Asia. Strong cultural ties to cranes and their wetland habitats provide opportunities to engage people in the conservation of the cranes and the lands and water they need. At Phu My in the Mekong Delta, ICF is helping villages around key wetland areas improve livelihoods through the sustainable production and sale of handcrafts made from wetland vegetation, which simultaneously protects the same wetlands essential to Sarus Cranes and many other species. An industry has been developed which has more than tripled local employment and local income by bringing professional weavers to teach local people how to harvest and weave the leaves of the dominant wetland grass Lepironia. 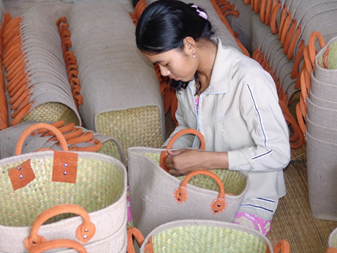 Proceeds from woven products have quintupled family incomes, and 300 families have been involved with the project. Income from the business has also supported wetland and crane conservation activities at Phu My. 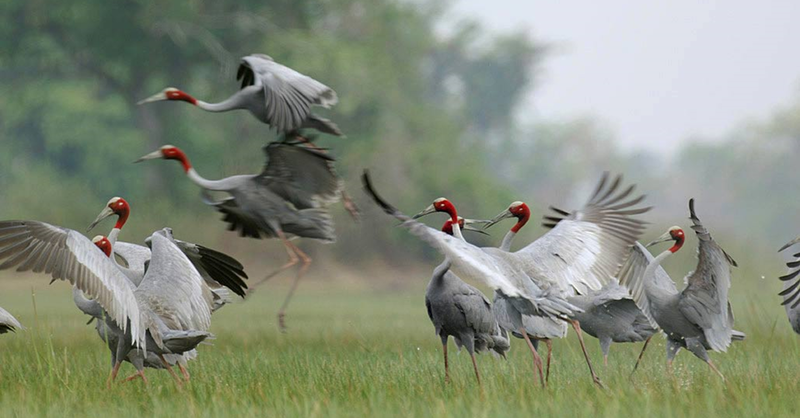 The Sarus Crane population using these wetlands has increased from fewer than 10 to more than 250 in some seasons. In recent years, product sales have supported 80-85% of the costs generated from the business and the conservation activities for Phu My. Phu My (1,200 hectares) is located within the Ha Tien Plain, which is an Important Bird Area of Vietnam. One of the most important sites for Sarus Cranes in the Mekong Delta, Phu My is now the only place in the Mekong River basin where the Lepironia wetland (named after the dominant plant species of the vegetation – Lepironia articulate, Cyperaceae) still exists. Anlung Pring Sarus Crane Sanctuary (600 hectares) is an Important Bird Area of Cambodia and is another important site for Sarus Cranes in the Mekong Delta. Phu My and Anlung Pring combine to form a trans-boundary protected area between Cambodia and Vietnam. Together, they host the highest number of Sarus Cranes in the Mekong Delta during the dry season, accounting for up to 40% of the total population of 800 Sarus Cranes in the Lower Mekong River basin.